A recent report published by Infinium Global Research on respiratory drugs market provides in depth analysis of segments and sub-segments in global as well as regional respiratory drugs market. The study also highlights the impact of drivers, restraints and macro indicators on the global and regional respiratory drugs market over the short term as well as long term. The report is a comprehensive presentation of trends, forecast and dollar values of global respiratory drugs market. According to report the global respiratory drugs market is projected to grow at a CAGR of 7.1% over the forecast period of 2018-2024. Increasing product innovation and approval in respiratory disease and disorders such as LABA/LAMA fixed dose combinations in COPD, novel biologics in asthma and in cystic fibrosis (CF) are the key market trends anticipated to drive the global respiratory drugs market over the forecast period. Growing prevalence of respiratory disease such as COPD, pulmonary hypertension, asthma, cystic fibers, allergic rhinitis and idiopathic pulmonary fibrosis owing to habits like overeating, smoking and lack of exercise are the key factors responsible for the growth of global respiratory drugs market. Moreover, increasing prevalence in respiratory disorders are further expected to drive the respiratory drug market over the forecast period globally. The report on global respiratory drugs market covers disease segments. On the basis of disease the global respiratory drugs market is categorized into COPD, pulmonary hypertension, asthma, cystic fibrosis, allergic rhinitis and idiopathic pulmonary fibrosis. The report provides profiles of the companies in the global respiratory drugs market such as, FibroGen, Amgen, Dr. Reddy's Laboratories, Afferent Pharmaceuticals, Dainippon Sumitomo, Abbott, Horizon Pharma, Pfizer. The report provides deep insights on demand forecasts, market trends and micro and macro indicators. 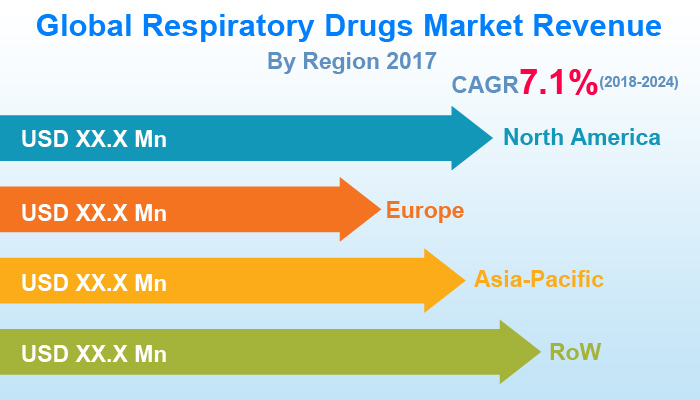 In addition, this report provides insights on the factors that are driving and restraining the global respiratory drugs market. Moreover, IGR-Growth Matrix analysis given in the report brings an insight on the investment areas that existing or new market players can consider. The report provides insights into the market using analytical tools such as Porter's five forces analysis and DRO analysis of respiratory drugs market. Moreover, the study highlights current market trends and provides forecast from 2018-2024. We also have highlighted future trends in the respiratory drugs market that will impact the demand during the forecast period. Moreover, the competitive analysis given in each regional market brings an insight on the market share of the leading players. This report will help manufacturers, suppliers and distributors of the respiratory drugs market to understand the present and future trends in this market and formulate their strategies accordingly.